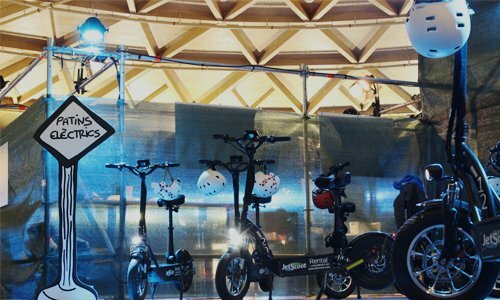 In JetScoot we not only offer rental services, we are also known for collaborating with companies that organize events. 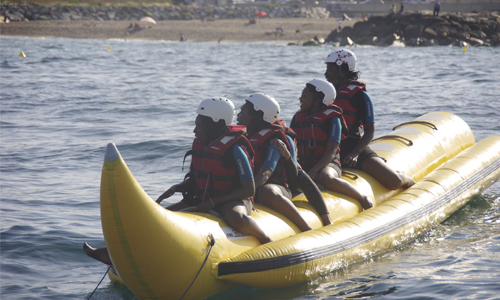 Due to our extensive infrastructure, we are able to offer exclusive and very attractive activities for large companies that want to offer something different to their employees. Do you want to organize an event? JetScoot has everything you need! 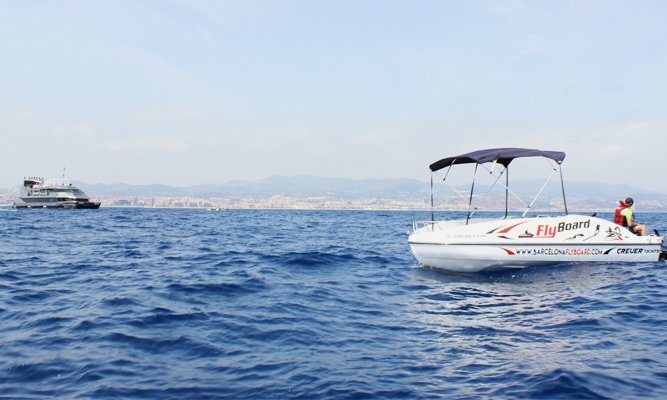 As you know, our star service is extreme water sports where we can boast a good list: jet skis, flyboard, wakeboard, hoverboard, boats and inflatable floats. Organizing an event with these services is a great success if the goal is to make customers experience something different and be more than satisfied. 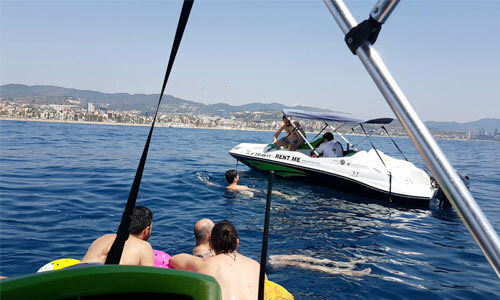 "Flyboard event with Café del Mar"
From scooters with saddle and of great autonomy to make great routes during the day until light and folding models for those who look for something more practical. Event organizers request our services mainly to organize tours in the city in a different way. 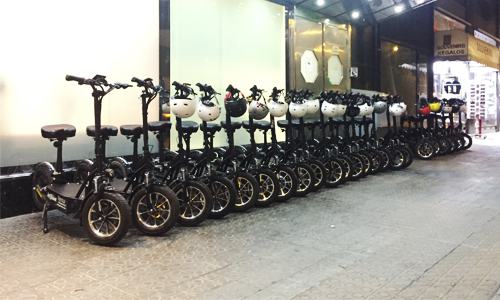 The possibilities offered by these new vehicles together with the incentive that they contribute to the environment have caused that the activities with electric scooters are one of the main tourist attractions of Barcelona. 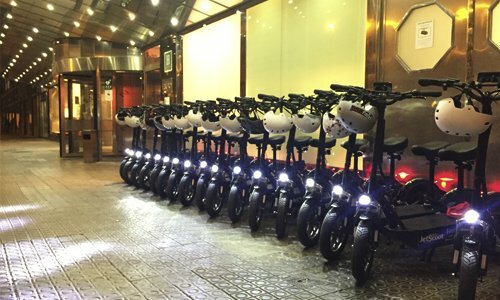 "Electric Scooters in Las Las Arenas"
"Barcelona downtown visit with electric scooters"
"Organized event for 30 people"
We also take care of great parties organization! 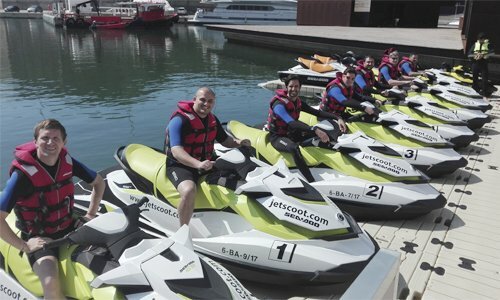 Do you imagine celebrate your friend bachelor party with maximum adrenaline that Jet Ski offers you? Or why not try to flly with a Flyboard for first time? Remember we have boats rentals without license, bananas, electric scooters... Lots of services that offer you different options to celebrate bachelor parties. If you want great parties, our services won't disappoint you. "Bachelor Parties with Jet Ski"
"Friends big groups Jet Ski parties"
"Flyboard, a great activity for groups"
"Bananas, Crazy Sofas and different types of water activities"
In the city of Barcelona the tourism does not stop growing and the fact of traveling with traditional and electric bicycles or electric scooters is becoming one of the most common actions carried out by locals and tourists to discover the history offered by the city of Barcelona. We will start this historical tour through the Parque de la Ciudadela, which was for many years the only park in the city of Barcelona. Next, we will cross the Arc de Triomf, designed by Josep Vilaseca in 1888, which hides a civil component that represents scientific and economic progress. We will continue through the Parque de las Aguas, with an area of 1.95 hectares, it's different from the rest for to the large amount of vegetation that abounds. The next point of visit will be the Hospital de la Santa Creu and La Pau, one of the oldest buildings in the city designed by Lluís Domènech i Montaner. Following for the Gaudí Avenue, we will arrive at the well-known temple of the Sagrada Familia, the most innovative and ambitious work of Gaudí. There we will visit the square that occupies the entire block and continue through the Plaza de Pablo Neruda to finish at the Olympic Port. We begin this tour in a unique construction of the city located in the Forum Park, where is the Museu Blau. 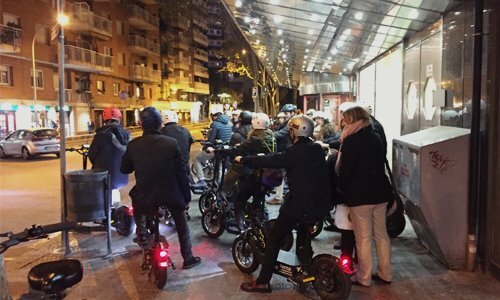 We will continue the route along Avenida Diagonal in the direction of Torre Agbar, contemplating the streets characteristic of Barcelona and crossing Paseo de Gracia until we reach the historic Plaza de Francesc Macià. We will continue along Numancia Street to reach the Sants Station, which has a large number of national links and other European countries. We will arrive at the imposing Plaza España to visit the Joan Miró Park and continue along the Avenida del Parallel until we reach the great Monumento a Colón. Finally, to complete this journey full of history and culture, we will find Gato de Botero, that after 15 years has finally found a home in the Rambla del Raval. Live the experience and discover Barcelona with our tour starting in the heart of the city, Plaza Cataluña. We tour along Paseo de Gracia and its urban and modernist airs such, as Casa Batlló and Casa Milà (popularly known as La Pedrera, at a cost of around € 25 each). We will discover the architectural works of the Apple of Discord and arrive at the Park Güell, one of the most important buildings in the world. From there, we will descend to the Sagrada Familia, considered a World Heritage Site. Now that you know, if you want to organize an event for your customers you just have to contact us. Tell us what you want to do and we will take care of sending you a proposal that is totally to your liking!